For my birthday last week we headed up to Rhode Island and visited Newport, amongst other things! Our trip started in Newport, but we also visited Mystic Seaport, Providence and Jamestown! But for today let’s talk about Newport! Going in I really didn’t know what to expect. Everyone said “oh it’s so nice there!” “I love it there!” etc. I was expecting a cute little New England town, so I was honestly surprised by how big it was! If you’ve been there you might disagree, but it was just a lot bigger than I had set myself up to expect. Newport reminds me of a fancy Key West. A touristy spot on the water, but with less drunken debauchery and more fancy restaurants and shops. The views of the water were spectacular and we all loved walking along the docks and seeing all the boats! 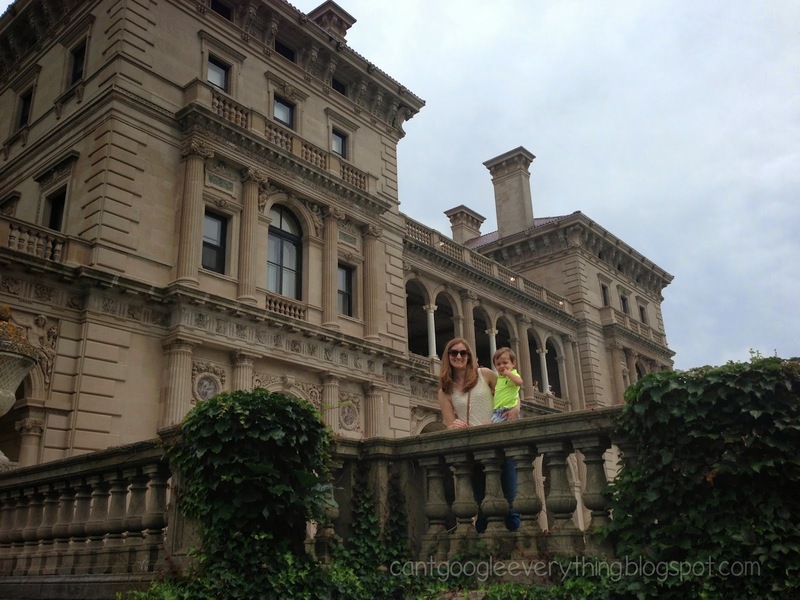 We also took a boat tour, visited the Breakers historic mansion and walked along the beautiful cliff walk! Here are just a few of the shots from that day! I can’t show you everything because I took way too many photos! On the road to Rhode Island! At The Breakers mansion. We’re thinking about moving in. View from the cliff walk. Don’t worry, Andrew’s making sure Carter doesn’t fall over the side! This was taken on Tuesday when Carter and I went back for my birthday and Andrew had to work. On Saturday this was completely packed with people! View of Newport from the boat ride. Shark touch tank at the “save the bay” aquarium! Carter squealed with delight each time he touched the sharks! Touching the crabs in the touch tank! My cute birthday lunch date at22 Bowen’s Wine Bar & Grill, which if I am being completely honest, was just “okay.” The view was great, but the food was mediocre. We did a lot of other stuff on this trip besides going to Newport, which I’ll share this week! I know you’re excited! Have you ever been to Newport? What did you think of it? Fancy KW – ha! Here in KW now and figure maybe one of these days I'll actually put on my khaki shorts…been in running shorts and a tank top..and overdressed! Absolutely love these pics! I've always wanted to go to Newport, this just made me want to go even more! That mansion though!!! Gorgeous! How great! I like seeing where other people go. We'd definitely like to go there. Thank you for sharing! I liked Newport a lot, we stuck mostly to the dock type area. I loved the Cliff Walk! Great pictures. I was there for a brief visit when we were at the University of Rhode Island for the regional soccer tournament- which is how I have gone practically anywhere- soccer trips are our vacation. Beautiful trip photos Rachel! Newport is so fun!! You should definitely move in! That place looks amazing, haha. What a beautiful place! Looks like an amazing time! By FAR one of my favorite places! So jealous! What a beautiful place. We've talked of going to RI, I hope one day we can! What a fun trip! I know what you mean about Newport being bigger than you think – there really is so much to do!